There are many things to consider when negotiating a contract with a digital agency. 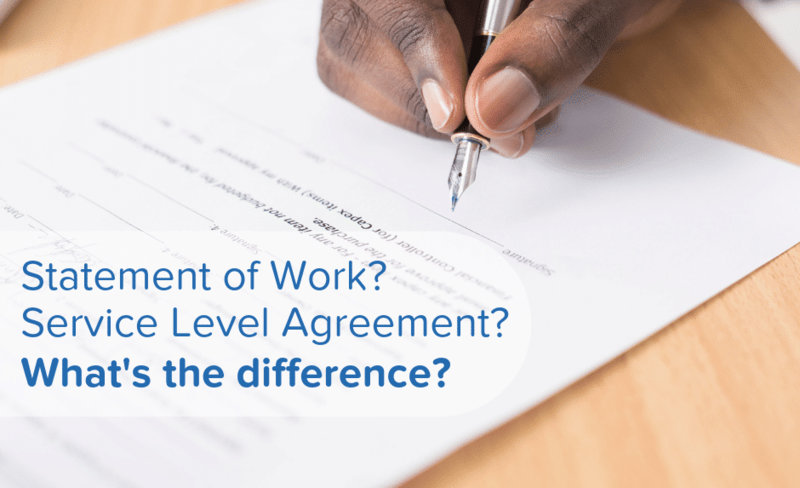 In this post, we’re going to talk about the difference between a Statement of Work (SOW) and a Service Level Agreement (SLA). These two documents describe specific aspects of how an agency is going to serve your needs as a client. In some cases, these documents could represent the entirety of your contract, or they may be sections contained within a larger contract. Some projects only require an SOW or an SLA, while others require both. Since the SOW and SLA represent two different facets of your working relationship with the digital agency, let’s walk through the basics of each one. The Statement of Work (SOW) provides a detailed and descriptive list of all the deliverables of a project. In the case of a website project, this would refer to the specific features and functionality the digital agency is going to develop for your web presence — and when they should be completed. A vague SOW only opens the door to disputes. Sometimes referred to as the “Scope of Work,” the SOW is important not just because it tells you what to broadly expect from your digital agency. It also serves as a compass for project management so both parties can track the progress of the website project and make sure everything is going according to plan. A well-constructed SOW will be very detailed — sometimes painstakingly so. Why? Because a vague SOW only opens the door to disputes. It’s in the best interest of both parties to eliminate vagueness whenever possible. For example, a statement to the effect of “The agency will construct a website for the client by November 1” is far too ambiguous. It fails to address how many pages the website will have, what features will be included, what constitutes a completed website, or how the client’s satisfaction fits into the equation. Under this vague language, the agency could technically develop and upload a one-page website on October 31 with a few words describing your company, claim the terms of agreement have been satisfied, and walk away with your money. There would be precious little you could do about it. So even though it may feel tedious, make sure the language in the SOW is as descriptive as possible. Leave absolutely no room for misinterpretation. To facilitate this goal, we’ll now cover the elements that a good Statement of Work should contain. Depending on your situation, you may need additional elements in your SOW than what is discussed here (for example, a section for security or other special considerations), but the points discussed below provide a good basic framework for an SOW you can trust. This section breaks down the entire project into specific tasks that will be required to complete the deliverables as outlined in the scope of work. For example, in developing a website, what tasks will be performed during the design phase and by whom? What happens during the build phase? The digital agency should detail these items here. This information might be found in multiple sections (e.g., Period of Performance, Schedule of Completion), but somewhere, the digital agency should specify how long your project is expected to take, along with a detailed schedule and milestones for completing each step of the project. This information not only provides a roadmap and timeline, but it also helps you understand the development of your website step-by-step. This section discusses how you will approve certain steps in the design, build, and implementation of your website before the next steps are taken, and who is responsible for signing off on each step. This is also where you should find clarity on what satisfaction means. While the SOW mainly deals with specific deliverables associated with the development of a website, the Service Level Agreement (SLA) details the terms of any ongoing services provided by your digital agency. This typically includes services like web hosting and site maintenance. If you’re hiring the digital agency only to build your website, and you plan to host it elsewhere, you probably will be fine with just an SOW. However, if you’re entering an ongoing relationship with this provider that involves servicing, hosting, and/or marketing your site, make sure your contract paperwork includes an SLA, and make sure you understand its terms. The SLA is a critical part of your contractual agreement, especially if the digital agency is hosting your site, for one very important reason: at some point, your website is going to go down. It is a computer-operated system, and all computers eventually fail. When the computer that hosts your site fails, your website goes offline until the digital agency fixes the problem or replaces the server. You need to know how the agency is going to respond when that happens and what happens to your website — and your business. (Again, it’s “when” not “if”). This section tells you exactly what ongoing service(s) you’re hiring the digital agency to do. It will usually cover website hosting and maintenance, but it may also include additional services like updating your blog, email marketing, tracking metrics, etc. This part of the SLA details the level of service you’ll be receiving — for example, how much bandwidth your website is permitted each month, how much uptime is guaranteed, how much downtime is allowed within the agreement, as well as what the terms are for offline maintenance. It is normal for a certain amount of acceptable downtime to be included in your SLA. Your web host may guarantee 99.9 percent uptime in their SLA. But taking into account the number of hours in a year, that means the web host is allowed to let your website go down for four hours per year. You may think a 99.9 percent uptime agreement is near perfect. However, you may not think it’s perfect enough during those four hours of allowed downtime. In addition, there may be exceptions to the downtime allowance provided by the SLA. For example, so long as the agency provides advance notice, overnight downtime resulting from scheduled maintenance typically isn’t included in your four hours per year. That’s right — you could face many hours of scheduled downtime even with 99.9 percent uptime. How will the digital agency monitor its own service to make sure it’s meeting the minimum requirements? Is there a third party that audits the uptime? This section should provide those answers. This section is very important to you as a customer because it tells you in what ways (if any) you’ll be compensated for any failure of service. For example, if your website goes down for longer than the acceptable amount of downtime, will you receive credit for that downtime? If you lose income as a result of that downtime, to what extent, if any, is the service provider responsible? This is the part of the SLA that outlines how long the digital agency has to respond to server failures or other problems afflicting your service. Now that you know the difference between an SOW and SLA, your biggest takeaway should be that anything not specifically mentioned in your agreement is not included in your agreement. If you need something from your digital agency that is not put down in writing, the agency is not legally obligated to provide it. So if you need a particular service, a specified response time, 24/7/365 accessibility, or anything else to keep your website and business functional, make sure those terms are included in the SLA before you sign.